Boulevard One capitalizes on every opportunity to be water-wise and to tap existing resources. North of Lowry Boulevard, we’re preserving 33 mature trees already on the property, transplanting 23 more and adding 157 new trees, increasing shade at Boulevard One by 250% over time. It’s estimated that approximately 60,000 square feet of manicured turf grass will reduce water consumption by 50%, and 130,000 square feet of irrigated shortgrass will help Boulevard One remain green using little water. When the north neighborhoods are fully developed, almost a mile of sidewalks will interconnect Boulevard One’s greenery, dotted with over 3,000 shrubs, perennials and ornamental grasses. The Wildlife Weave art installation is underway on the berm along Monaco Parkway; watch for more trees, shrubs, grasses and plants to support local birdlife. First Avenue is also getting spruced up with new street trees, sidewalks and bike paths. Boulevard One’s many parks and open spaces are taking shape! 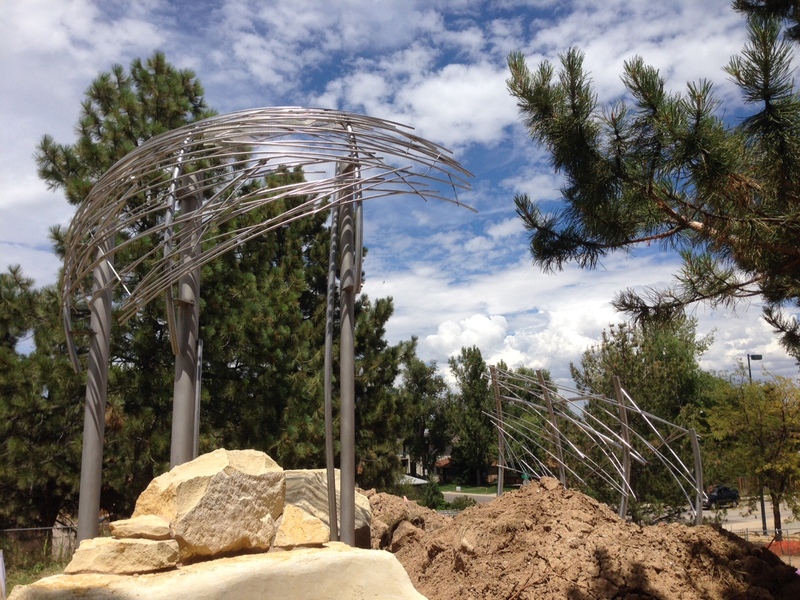 In addition to the paths, art and plantings along Monaco and First Avenue, Boulevard One will be home to shady Kiva Park to the east, Center Park with perennial gardens and lawn, Adventure Park for exploring boulders and a cottonwood grove, and intimate Triangle Park. For more details, check out the Northern Parks Overview. Three more parks — five-acre Community Park, a neighborhood park and natural open space — are planned for the southern part of Boulevard One. Look for those plans in the coming months. Say Hello to Boulevard One’s First Residents, Moving in This Month! High-style Alto joins the popular Vue Collection of single-family homes from Infinity Home Collection. These three-story light-infused homes feature rooftop decks with expansive views of the mountains and city lights. For more information, contact Austin Ellis at 303.229.7845. Six homes on the block south of First Avenue and west of Magnolia Street signal the first set of custom homes within Boulevard One. An additional 19 custom homes will be built west of Quebec Street on Archer Place. Bello Custom Homes and Wall Custom Homes join Alpert Signature Homes, GO Builders Inc. and Latsis Custom Homes as Boulevard One’s custom home developers. See our lot plan for details. I enthusiastically chose Lowry for its appealing central location, “live-work-play” concept and new urbanism community. Boulevard One’s business establishments within walking distance will encourage people to get out of their cars and walk or bike. Take a closer look at the berm on Monaco Parkway and First Avenue, and you’ll spy the latest in Boulevard One’s public art. 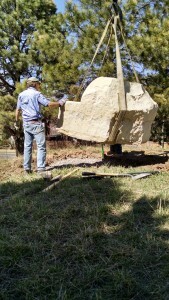 “Wildlife Weave” will be surrounded by carved boulders and water-tolerant landscaping that will serve as a habitat for local birds. A walking path will offer great views. Lowry is one of the most walkable, bikeable, park-filled and context-conscious neighborhoods in Denver. 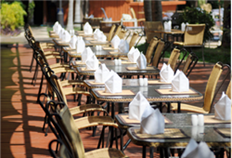 Boulevard One builds upon that legacy and allows more people to be part of it. 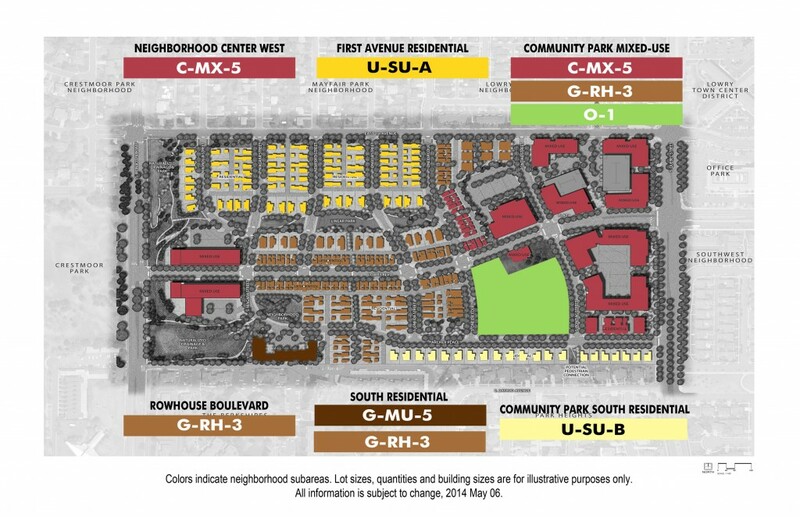 After a final public hearing on June 29, Denver City Council voted unanimously (12-0) to approve mixed-use zoning along Lowry Boulevard and Quebec Street. Boulevard One residents and nearby neighbors will be able to walk to an exciting variety of restaurants and shops, entertainment, offices and apartments. Future development will follow the same parking allocations and height limits as the rest of Lowry. Please note that each builder has a different schedule for home design, pricing, construction approvals and permits. Thank you for your patience! 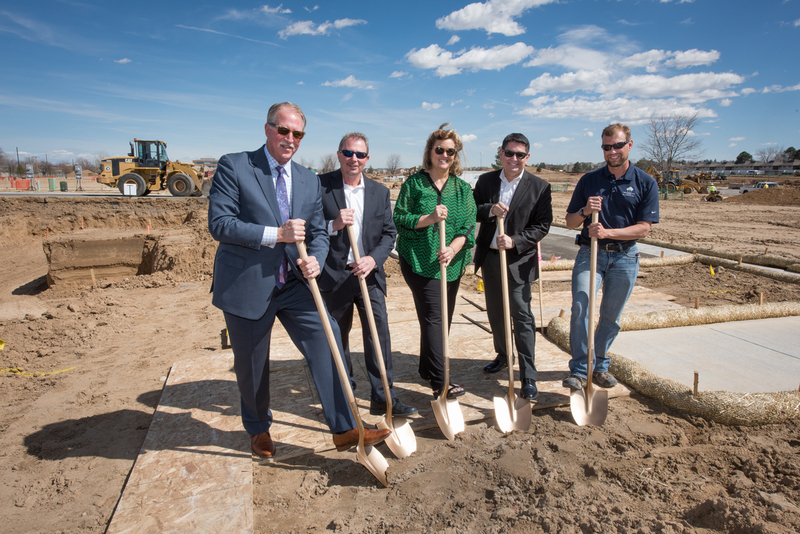 Infinity Home Collection and Wonderland Homes are the first to break ground at Boulevard One. 80 single family homes will be built in this first phase. Other builders will break ground in coming weeks. For sales info, please contact builders directly here. Public art will be part of daily life at Boulevard One. The urban design team includes David Griggs, a noted local artist. “We’d like to create unexpected and meaningful experiences as people live, socialize, work and recreate in the neighborhood,” he says. Public art can serve to orient people in an urban landscape. Pieces might be markers, views, gathering places and links. Two installations are now underway. “Wildlife weave” features carved boulders, a walking path, native landscape and two woven steel sculptures on top of the north side of the berm on Monaco Parkway. An “urban kiva” will be a small gathering place in the first neighborhood park. 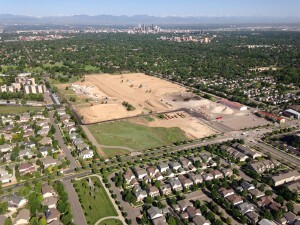 Confluence Denver recently published a great article about the ongoing transformation of the former Lowry Air Force Base into a vibrant and interesting neighborhood. You can read it here: Lowry: Metamorphosis from Military to Mixed-Use Nears Completion. The largest building on the Boulevard One site has been demolished. Formerly known as the Defense Finance and Accounting Center, the 600,000 square foot, 3-story building was built in 1974 and housed 3,000 employees. Materials such as metals and concrete have been recycled. The rowhomes will offer city living along with features like rooftop decks in contemporary buildings designed with historical touches. Floor plans and pricing are not yet final. Construction is anticipated to begin in mid-2015. East West Partners and BuildMark will develop 36 three-story rowhomes. Widely known for their work in downtown’s Riverfront Park and Union Station, East West and BuildMark have partnered with Sprocket Design-Build, architect and builder of successful multifamily projects in downtown neighborhoods like Highlands, Curtis Park and Jefferson Park. “The LRA has worked for years engaging neighbors and wide swaths of the city to create an incredible master plan for Boulevard One. They’ve also assembled a great team of Denver’s best developers to execute that vision, and we’re honored and lucky to be a part of it,” said Chris Frampton, Managing Partner at East West. 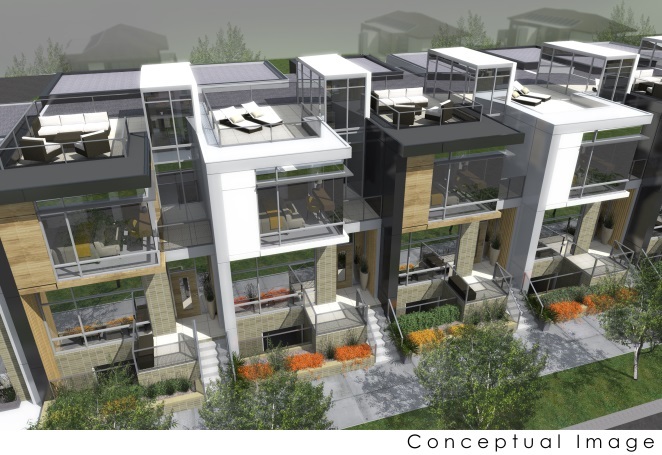 Koelbel Urban Homes will build 35 two- and three-story rowhomes designed by Denver’s Neo Studio. 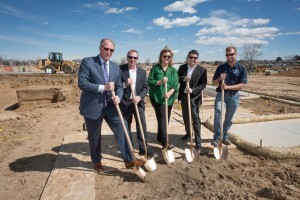 One of Denver’s oldest family-owned development firms, Koelbel and Company created a new division to meet the lifestyle and location desires of a new generation of homebuyers in neighborhoods such as Lower Highlands and River North in Denver, and Lee Hill in North Boulder. “The Boulevard One vision is one we seek: an imaginative neighborhood that promotes community and synergy built around life, work and play in an urban environment,” said Peter Benson, senior vice president of Koelbel and Company and manager of Koelbel Urban Homes. Minimum parking requirements for the rowhomes are consistent with Denver’s old Zoning Code, with 2 spaces per rowhome. More rowhome developers will be selected for Boulevard One in the coming months. Interested buyers should contact builders directly through our website, at boulevardonelowry.com/homes/rowhomes. Improvements to First Avenue will begin in early November. Overhead utilities on the south side of First Avenue will be removed, and new utilities buried. The south side of First Avenue will be further improved with a new sidewalk and street trees. First Avenue will be re-striped to add bicycle lanes on both sides of the street. 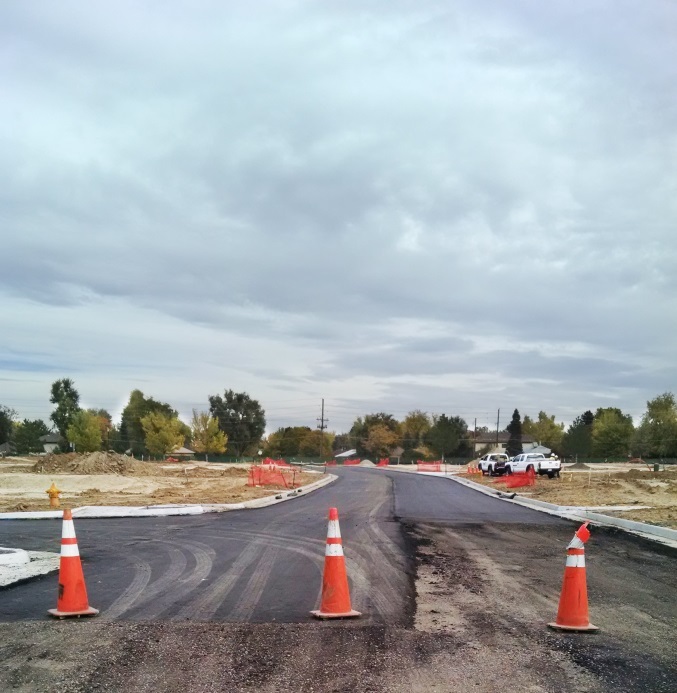 New Boulevard One side streets are being finished and will be connected to First Avenue in a phased manner, starting late this year or early next year. Traffic flow on First Avenue will be maintained while these improvements are underway. Construction of parks and open space areas north of Lowry Boulevard will begin in November. A linear park through the single family home area will include walking paths, nativeplants, grasses, shrubs and trees, an artful gathering spot and natural play area. More earthwork and preparations for new landscaping will begin on the north end of the berm on Monaco Parkway. Single family homebuilders may start construction late this year. Prospective homebuyers should contact builders directly. Please visit www.boulevardonelowry.com for details. 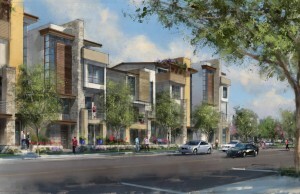 For more information about Boulevard One, visit www.boulevardonelowry.com. Denver Public Schools is hosting a community meeting to discuss the proposed expansion of Lowry Elementary School on October 7, 2014, from 6 to 7:30 p.m. Learn more about the meeting here: Invitation from DPS. The Denver Post’s YourHub reported on Lowry’s Boulevard One this week. 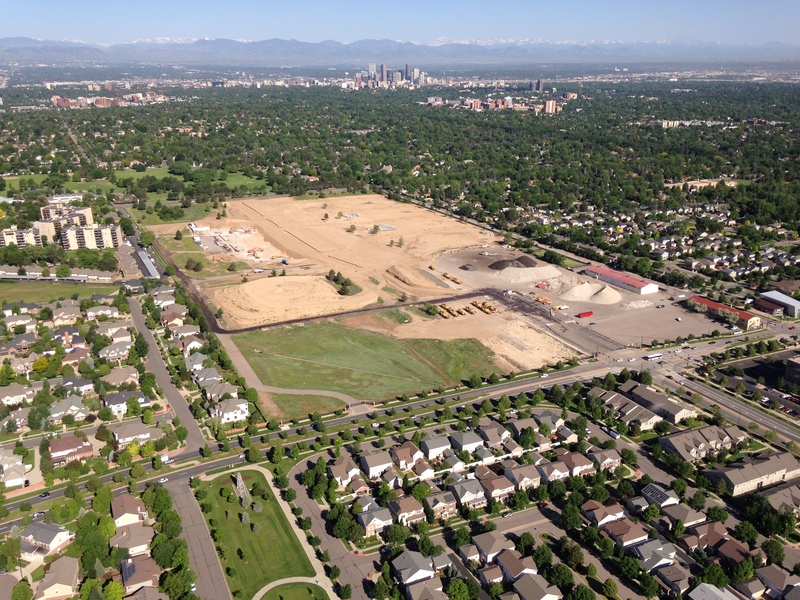 Reporter Joe Vaccarelli writes, “the Boulevard One development in Lowry could see construction starting by early fall in one of the last major urban infill projects in Denver.” Click here to read more! Boulevard One construction activity will affect First Avenue between Monaco Parkway and Pontiac Street this summer. Traffic flow on First Avenue will be maintained throughout the work. New roads will connect to First Avenue, and the south side of First Avenue will be improved with a new sidewalk, street trees, bicycle lane and underground utilities. Two construction projects are underway or planned near the berm on Monaco Parkway. The Lowry Boulevard corridor is being graded to allow for installation of electrical utilities. Lowry Boulevard will not be connected to Monaco Parkway until 2016. Lowry Boulevard, from Niagara Street to Quebec Street, will be built and opened in 2015. More information is posted under “Current News” at www.boulevardonelowry.com.